content marketer by trade, creative writer by passion. Describing Marrakech Restaurant is like describing the perfect man: charismatic, passionate, beautiful smelling, delicious and has the ability to leave me in a state of total euphoria. For me, dining out is not just about good food or the convenience of not having to cook at home, it's about an 'experience'. So if you want more than just a good meal, you should try Marrakech. Without turning this into a whimsical fairytale, I am going to go so far as to say that this place is truly magical. From the carefully thought out décor to the wait staff dressed in traditional Moroccan attire, complete with fez, this place will take you into another world. You will feel all this before you have even eaten or had the pleasure of meeting Mohamed, the beating heart of the establishment. He is the owner and head chef of Marrakech and does not limit himself to the kitchen; he regularly comes out and interacts with his patrons. Oozing with charisma and laid-back vibes, Mohamed will greet you like a long lost friend and make you feel right at home. He looks like a young Bob Marley and has the unique ability to turn any ordinary night into a party. [ADVERT]I am actually salivating just thinking about how to describe the food at Marrakech. My recommendation is to try the banquet. The food journey starts with stuffed dates and dips, followed by a Bestella (one of my favourite items on the menu). It's sweet, it's savoury, it's delicious. Rightly or wrongly, I have been describing it as a fancy spring roll. It is chicken spiced with cinnamon, wrapped in pastry and lightly dusted with icing sugar, served with a warm salad. Then it's time for the tagines. 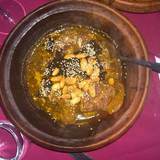 My favourite is the Afrah tagine which is perfectly cooked tender lamb with cinnamon, honey, prunes, almonds and sesame seeds. It is well presented, delicious smelling and a true taste sensation. Dessert is as tantalising as a trip to Willy Wonka's chocolate factory. The Persian fairy floss, cous cous, nuts and fruit dessert is a whole new level of awesome. As you work your way through the textures of the dish, you will find yourself in Cherry Ripe heaven. You will know exactly what I mean when you try it. Finish the night off with a mint tea. The pouring of the tea is a spectacle. It gets poured from a height into glasses on a tray below in order to aerate the tea. This originally made me slightly anxious that I was going to become a burn victim but fret not, the staff are highly skilled and no one was hurt. Arrive as a stranger and leave as a friend. Once you have experienced Marrakech for yourself, I promise you will be back for more. And like the perfect man, you will want to introduce Marrakech to all your friends. Start your love affair with Morocco today. Sounds like some really interesting combinations. I never would have imagined chicken and cinnamon going together. 66 King William Road is not Adelaide, it's not even Hyde Park, it's in Goodwood. Everything you say about this restaurant is true. It's one of the most wonderful and delicious experiences you will ever encounter. There is now also a Marrakech restaurant open in O'Connell Street, North Adelaide, which is the one I have been too. The staff are very warm and friendly and took the time to explain different dishes and how they are eaten. I too had the chicken pie and the flavour has to be tried to be believed. We were so full after the main meal on our first visit, we went back another night just to enjoy dessert. Looking forward to my next trip to SA and Adelaide to re-visit this restaurant. Do yourself a flavour favour and enjoy a night at Marrakech. Be sure to try the mint tea. Thanks WeekendNotes. I am making a booking for this Saturday. Did not know this restaurant was on KW Rd so am keen to try. Person who replied "66 King William Rd is not Adelaide......." - Get a life. Where is the circus Held !!!! !